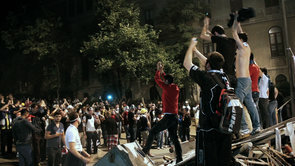 Our latest film, Taksim Commune: Gezi Park and the Uprising in Turkey, will play on Free Speech TV. Free Speech TV is an independent, 24-hour television network and multi-platform digital news source with news, stories and perspectives you won’t find anywhere else. A non-profit, public interest network, FSTV is publically supported by its viewers and by philanthropic foundations. Television broadcasts are commercial-free. Free Speech TV reaches 30 million U.S. homes on DISH Network Channel 9415, DirecTV Channel 348 and over 200 cable stations, and is now broadcasting online at www.freespeech.org. Be sure to tell your friends and family to check it out!